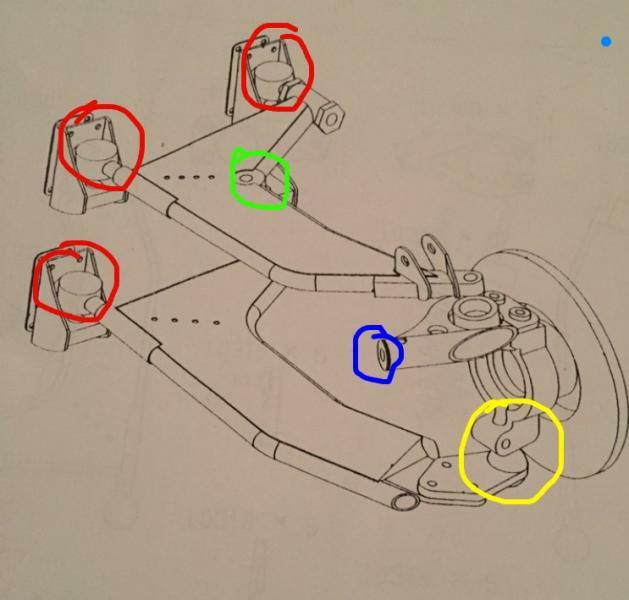 Loving my recent purchase of a Libra, but sadly she needs new rear suspension ball joints and so thought I'd summarise what I've found out so far and wonder if anyone can identify the ball joint required nearest the hub? Green and Blue track rod (not sure which ball joint is which, but...??) = Metro, part number 'FAI SS818' (T0310 on build drawings) and Peugeot, part number 'FAI SS451' (T0311 on build drawings). Need two each side there. Finally, there's the yellow one nearest the hub, can anyone help? The "yellow" bj is from an NON GTI rover 100. Otherwise your identifications seem correct - the pug bjs are, alledgedly, a little longer in the thread, though I am doubtful about this. So far as the 8 - off main bjs are concerned, make sure you het FAI ones, nothing else - they are easily the best, and usually have a useful hex socket in them to allow tightening without the ball turning. Search the big E foe a price - it is variable, and by a good bit. My recent lot were about £7 each. Perfect, many thanks for that- I can see the bracket matches perfectly for the rover 100 one. Will look forward to doing the job! !